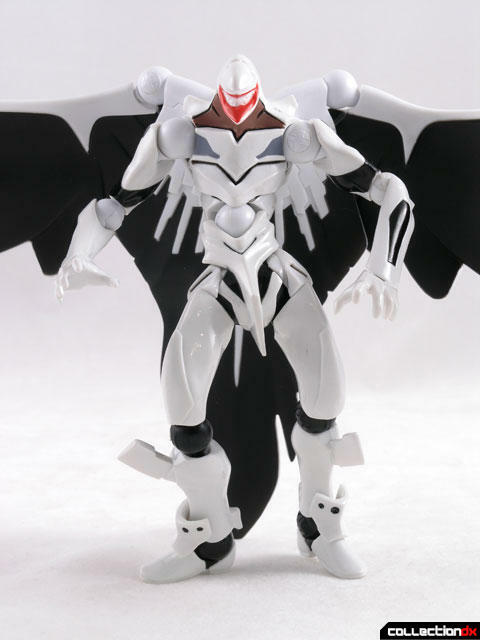 I know I was just bitching about the same Evangelion designs all the time, but this is one Eva toy that I am actually excited about. 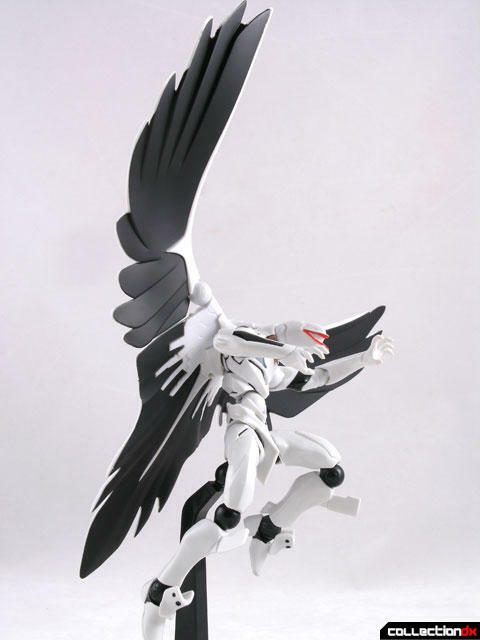 Evangelion Mass Production Type comes courtesy of HobbyLink Japan. 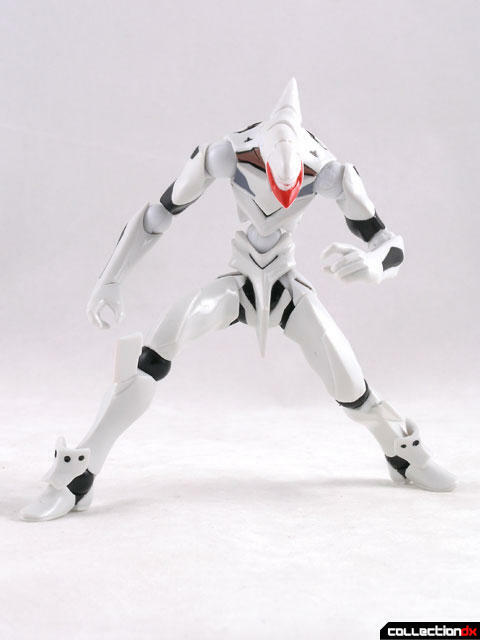 Out of all the Eva robots (or whatever they are) that have come out; this is the one I wanted the most. They never made a SOC of it, and the previous Kaiyodo line was just too fragile for my tastes. Now, with the Revoltech release, my wait is over. This toy is great! 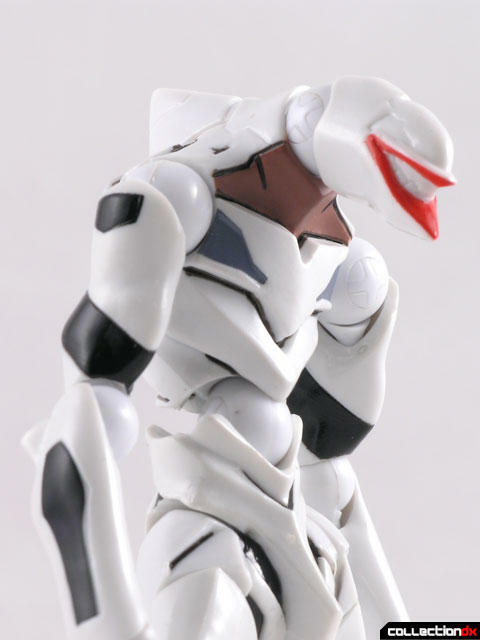 The Eva Mass Production type (Eva-05) comes from the End of Evangelion movie. 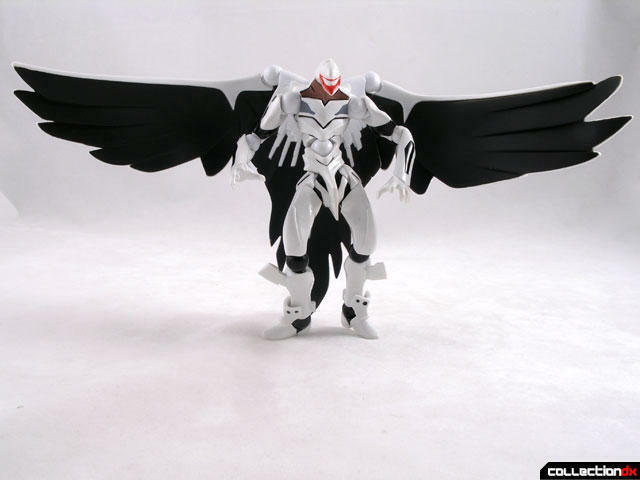 This winged monster is the final step in the evolution of the Eva units. These mass produced models require no power supply and no plug. The 26th Revoltech toy does this character justice. 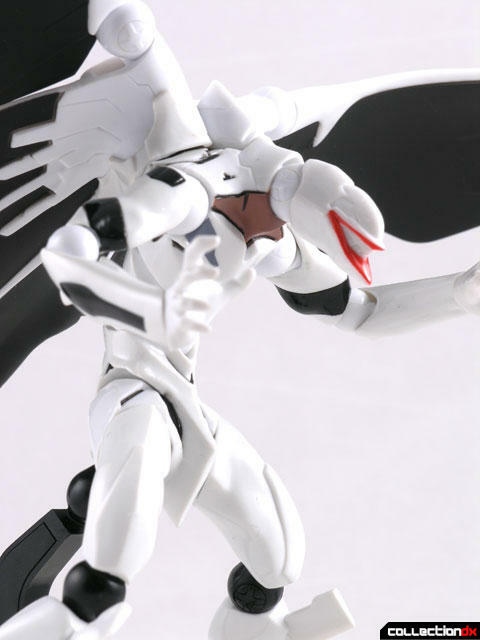 Molded almost entirely in white with black highlights, the Eva looks like devil dressed like an angel. Most striking here is the giant wings on the back of the figure. This unit can be removed and replaced with a small nub. 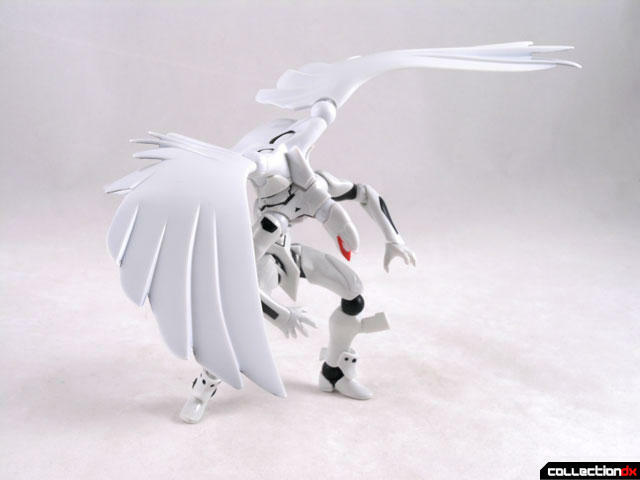 The wings are three parts connected via Revoltech joints. These wings are hard plastic – no floppy rubber here. The stand here is a necessity. If you want to get those cool flying poses you are going to need it. 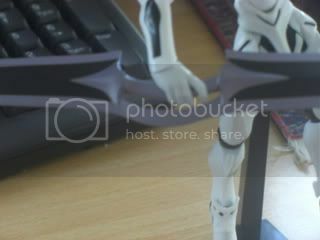 The stand is a two part stand with a Revoltech joint at the end. The joint can attach between the legs or beneath the wing assembly. Also included are a bunch of variant hands. Two of the hands have fists with holes in them, probably to hold the lance that is not included with this set. The lance was offered with another limited version of this toy. There are 2 claw-pose hands and then 2 hands that are a mystery to me. They look like they are hands for holding guns, but no guns are included. Eva Mass Production model looks great, poses great, and is just fun to handle. 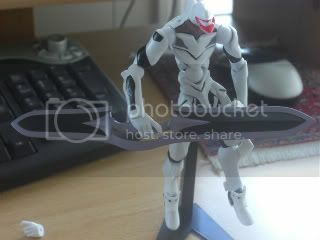 If you only get one Revoltech Eva, get this one. Available now from HobbyLink Japan. As to how they are controlled, I can't say since I haven't seen "The End of Evangelion" yet. Say, Josh, does this set come with an alternate version of the head that has the mouth open? I was thinking of swapping the head and neck joint with that of any of the other eva units but i wonder how that will look since the movable thorax piece of the older Eva-01 is not on the MP Eva. The gun-like hands are for holding the heavy lance that comes with the limited edition Lance version of the toy.